The formula for inventing a new gadget used to be simple: have an idea, set up shop in your parents’ garage, eat only ramen, and eventually create a multi-billion dollar company. Crowdfunding has changed all that. Promising ideas go from a web page to million-dollar production runs in no time. But is it really working? Kickstarter is famous not just for its successes but also the number (and scale) of its failures. Whether it’s a pocket-sized drone that crashed and burned, a playing card project that cut and ran, or a laser razor that never existed in the first place, crowdfunding has a reputation for outrageous moonshots and outright fraud. But it’s not a reputation that it necessarily deserves. Looking at the numbers, Kickstarters work far more often than not. In an independently-conducted, Kickstarter-facilitated study of tens of thousands of projects, only nine percent failed to deliver at all. A whopping 65 percent of projects even delivered on time! Those aren’t terrible numbers—one in ten failures is actually pretty good, and you can strengthen your chances of success if you choose your projects carefully. I say this because I’m an unashamed Kickstarter junkie. In the last year alone, I’ve backed five projects to the tune of $700, which is a lot of money when you’re an impoverished blogger. Do I regret it? Hell no. The first thing I backed last year was the Pebble Time watch, a fairly low-risk, high-return product. Pebble Kickstarted their first smartwatch (which I also backed!). The Canadian company received millions in pledges and is now cranking out high-quality wearables in the frozen North. With such a big company, I was confident that they weren’t going to do a runner with my cash, and I would get their new watch earlier and cheaper than waiting for retail. It turned out to be a good move. I got my watch on time, and the final product was the same thing that they promised on the Kickstarter page. We’ve got a much more in-depth review, but after months of use, the Time still hits the sweet spot as a simple smartwatch with killer battery life, for far fewer beer tokens than you’d spend on an Apple Watch. My only complaint is the screen, which is covered in a material that gets scratched to hell. Riding on my Pebble success, I backed a much less reputable product in March: Naked Filter, a water bottle with a in-built filter. It promises to deliver safe drinking water from any stream or lake. Compared to the hassle of using a pump filter, it sounded great, and the early-bird pricing was an entertainingly low $10 per bottle. Exactly a year later, I do have the bottle in hand, but it took awhile. Promised delivery was August last year, and mine arrived in February. Not ideal, but the end product seems to be worth it. As my old colleague Wes found when playing with an early prototype, it’s easy to drink from, and the filter is completely out of sight. I can’t swear to the effectiveness of the water filter, but I haven’t got violently ill yet. In June, I made my Kickstarter blunder of the year. Porter Key sold me on a neat keyring knife/bottle opener combo, so I dutifully handed over $23. It arrived quickly—two months is easily the fastest turnaround I’ve ever had on a crowdfunded gadget—but the end result sucked. There’s no locking mechanism, and the Porter Key is larger than expected and impossible to open. I gave it as a present to someone I don’t like very much. Summer continued, and I kept spending money. August saw me buy my most unexpected Kickstarter success—Fishbone, a docking station for electronics. It’s a well-designed charger with powerful USB ports and integrated cable management, but that’s not even close to the best part. For $39, I received a charging station, but more importantly, five superb Lightning cables. A quick reminder: Apple sells its cables for $19, and they’re made of a weak rubber and plastic that breaks every three months. The Fishbone cables are braided fabric with metal connectors, meaning they will never break. More importantly, they’re very unique looking, so your friends can’t steal them, and they come with integrated velcro cable-ties. I know nerding out over cables is the worst kind of nerding, but I would rate these as the best things I bought in 2015. I saved the biggest project for last. In September, I sank $375 into Peak Design’s new camera bag, along with a bunch of accessories. Again, we’ve got a more detailed review, which you should read, because this bag is utterly fantastic. I’ve been using it as a daily commuter bag that can also carry my camera, and it excels. The bag is supremely well-built, and the attention to detail on stitching, straps, and pockets is phenomenal. 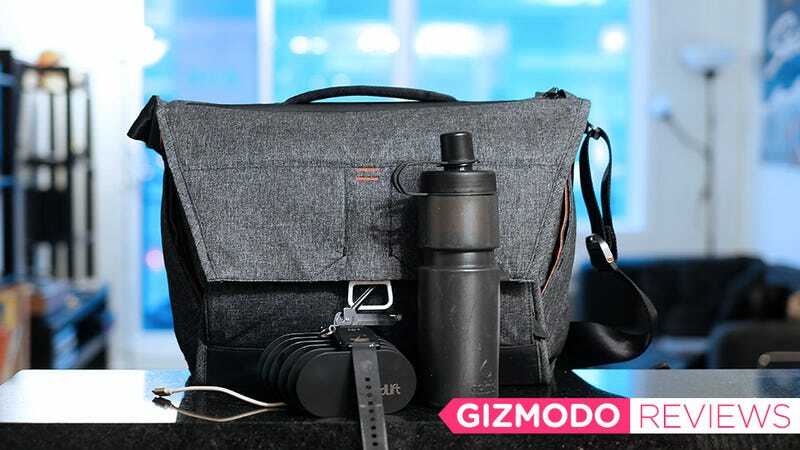 Sure, $375 is a lot to spend on a bag, but Peak Design isn’t a random company off the internet. It’s been making kickass camera accessories for years now, and at the launch of the Kickstarter, the company already had a bunch of prototypes out in the wild. Not getting burned by Kickstarter is reasonably simple: stick to ideas that are plausible and made by companies or individuals with reputation and experience. The biggest pitfall of the new products seen on Kickstarter is moving from prototype to production. The giant delay in Naked Filter’s bottle wasn’t due to some problem with the filter system. It was a leak the company found when it started trying to mass-produce a simple plastic water bottle. I talked to a few crowdfunded companies when researching this article, and a common theme of their experiences was the difficulty of manufacturing overseas. The founder of Revols, a Bluetooth headphone startup, described a “parasitic industry” of Chinese manufacturers who jump on unsuspecting entrepreneurs that have never mass-produced electronics before, causing months of delays, design changes, and price increases. The promise of crowdfunding is that in return for fronting cash, you’ll get your product cheaper and faster than you would otherwise. For me, it’s worked: I saved about $200 off retail for all the stuff I bought and received my stuff well before it was on general sale. But is it worth the stress, delays, and potential fraud? That’s between you and your credit card.